Located on the Palm Island Jumeriah directly in front of the iconic Burj Al Arab, Wild Wadi Dubai is a water amusement park popular with families. Themed around Juha, a popular Arabian tale in folklore, the park boasts over 30 rides and attractions, a heated/cooled wave pool, two simulated surfing machines, a number of water slides, an 18m waterfall activated every 10 minutes and a number of restaurants, snack kiosks and gift shops. 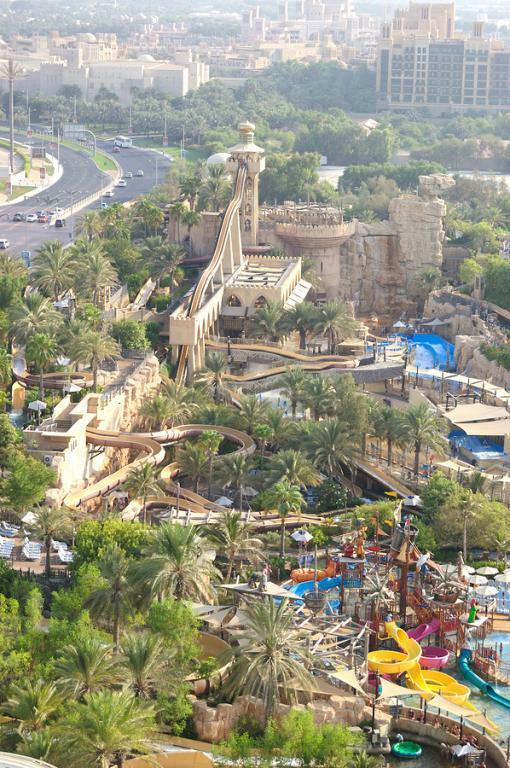 A great day for the whole family and a welcome way to cool off from the desert heat, Wild Wadi Dubai is home to some of the best rides in the United Arab Emirates, with attractions to suit visitors of all ages. From wave pools to lazy rivers, kids play areas to adrenaline pumping adventure rides, Wild Wadi Dubai has something for everyone. 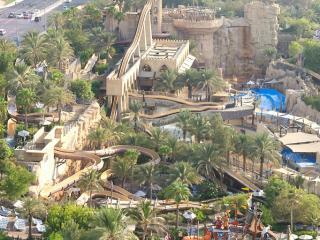 Offering some of the best views in Dubai, the Burj Surj features two large downhill waterslides and the notorious 'bowl'. Guests sit on a tube and soar down the slides towards the bowl before hurtling into two spiraling spins before being dropped back into the slide and splashing to the end of the pool. The Master Blaster uses high-powered jets of water to send you screaming around on an aquatic gravity-defying rollercoaster that rockets you 15m above the ground. Famous Tantrum Alley combines two downhill waterslides with three thrilling tornadoes that sees you sliding around and circling in the eye of the storm. Just when you think you've made it through the first tornado, you realise there's still two more to go - it's a scream! The Riptide and Wipeout Flowriders are one of only four of these types of rides in the world and offer a realistic surfing experience, using seven tonnes of water a second. Surrounding the Flowriders, the exciting Floor River uses unexpected surges of hundreds of thousands of litres of water to create 1m waves and speedy river rapids. For the younger children, Juha's Dhow offers more than 100 water activities including water guns, racing slides as well as a lagoon and 5 other water slides. A great family place to play and relax. When the water play gets too much, the lazy river of Juha's Journey is the perfect way to ride a gentle current for 360m of relaxation.